SANREMO: As you stroll along the sea front in the shade of the palm trees for which Sanremo is famous, you can gaze upon the splendid villas and luxuriant gardens, such as Villa Ormond with its enchanting park in which Mediterranean vegetations is interspersed with superb tropical plants. There is the ancient cathedral of San Lorenzo (St Lawrence) and the Russian Orthodox Church with its spectacular onion domes. Let yourself be lured by the magic of an evening in the Casino where everyone can try their hand with "Lady Luck". THE HINTERLAND: If You are seeking the true face of Liguria with its simple ochre-coloured houses, medieval towns and the scent of rosemary and basil, then travel up the Val Roya, where the hillsides are covered with centuries-old olive trees. Go up as far as the "Valley of Marvel" (La Valle delle Meraviglie) with its dense woods and delighful lakes, which you can also explore on horseback. Or go up the Val Nervia, where you will find an extraordinarily enchhanting landscape, an inspiration for artists, with its sensual blend of colours, scents and flavours. Here you will find the little town of Dolceacqua, dominated by the Doria Castle; Dolceacqua is famous for the Rossese and Vermentino wines. Further on is Apricale with its wonderful frescoed churches. Or you can visit the old town of Sanremo, known as "La Pigna" (the pine cone); roam along narrow winding streets, up steep paths, under archways and through tiny squares. CÔTE D'AZUR: Just a few kilometres away is the fascinating french coast. Go for a stroll along the Croisette at Cannes, following in the footsteps of kings, queens and cinema stars. Discover the many facets of the city of Nice: the splendours of the Promenade des Anglais and the bustiling narrow streets of the old town where the bars are lively well into the night. Or soak up the luxurious atmosphere of Monte Carlo with its famous Casino and elegant Princes' Palace. PREHISTORIC CAVES OF BALZI ROSSI: These spectacular cliffs of red rock, which rise sheer above the sea, testify to a fascinating period of man's past. Deep in their caves, the fossils, drawings and utensils of prehistoric man have been preserved for over 240000 years. These items can now be seen in the nearby Museum of Prehistoty (Museo Preistorico). GENOA AQUARIUM: Thrills and delight await you when you visit the Genova Acquarium, set in the heart of the old port of the city of Genova. In this, the largest marine acquarium in Europe, you can admire extraordinary forms of sea-life, come face to face with sharks, penguins, jellyfish, crocodiles, and now the amazing collection of humming-birds. VILLA HANBURY: On the promontory of La Mortola, is a garden of dreams where olive trees, vines and citrus trees blend with a most extraordinary array of exotic plants. The result is a true Garden of Eden, a botanic garden which is truly unique. 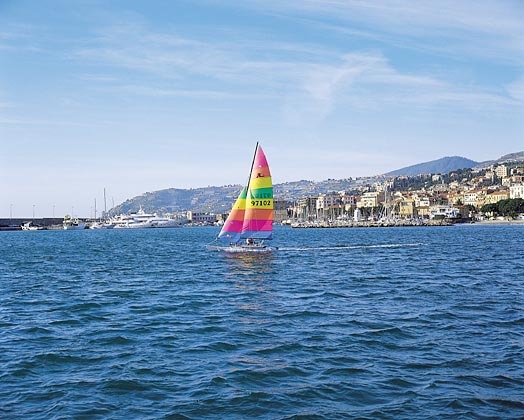 WHALE WATCHING: Off the coast from Sanremo is a stretch of sea where each summer, around 2000 whales and thousands of other sea creatures, such as dolphins and sperm whales, visit the warm water of the gulf. It is therefore possible to view these magnificent creatures in their natural environment without causing them any undue disturbance. BUSSANA VECCHIA AND THE ARGENTINA VALLEY: On a hill -top above Sanremo is the old town of Bussana Vecchia. It was badly damaged in the terrible earthquake of 1887, but is now home to famous artists and craftsmen froom all over the world. In the same valley, is the medieval town of Taggia, with its many artistic and cultural treasures. Further on is Triora, an ancient township famous for its medieval statutes, witch trials and fresco-adorned churches. 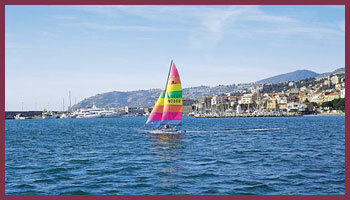 IMPERIA: In the heart of the Riviera dei Fiori, the town of Imperia is divided by torrential river Impero into its two component parts: Oneglia and Porto Maurizio. The area is famed for its olive oil production; if you wish to learn more about the 6000 year history of olive oil, its role in art, religion, food and everyday life, then a visit to the Carli Olive Oil Museum is a must. You will find it a short distance from the main square in Oneglia, just behind the railway station. CERVO: This little town is well worth a visit. Originally a township of coral fishermen, the profit made from this industry was used to build the picturesque "duomo". Here, in front of the church, in the summer months, you can enjoy live concerts organised by the International Festival of Chamber Music. Visit the interesting Museum of Ethnography situated in the castle, then the Villa Feraldi which can be seen rising above the olive groves. MARINELAND SEA LIFE PARK IN ANTIBES: Just a few kilometres from the Antibes exit from the motorway is this fascinating and fun - packed water park, complete with Aqua Splash, swimming pools, slides, wave-pools, sun-loungers and fast food service. Young children will love getting close to the animals in the park's farm; they can walk amongst ducks, geese, turkeys and peacocks. Then there is the trilling marine life show with sea lions and dolphins showing off their skills. You can also visit the Butterfly Jungle, Golf Adventure Park and the Colonel's Restaurant.